Click on a selection here overview questioning Jesus’ claim to be God Son of God Son of Man the Messiah (Christ) Messiah, Son, and God in one the "I AM" truth or lie the Transfiguration the Word Creator, Sustainer Christ’s self "compass" bridegroom and bride Bridegroom and Bride Jesus saves Other Commentaries , or scroll down the page. Some believe that Jesus was God, and others believe that He was merely a man. Many believe that He was both. These views have been debated for centuries by theologians and scholars. It is important to look at what the Bible—the Word of God—says about the matter. Many people believe that Jesus never actually claimed to be God. Personally, I feel that most people who believe this simply do not want to believe that Jesus was/is God; and they use the invalid statement, “Jesus never claimed to be God,” as alleged “support” for their lack of belief (and lack of a careful study of the Gospel accounts). Firstly, as the Messiah or Servant appointed by the Father to accomplish His Plan of salvation for mankind (Isaiah 59:16), it was not Jesus’ primary purpose to extol Himself as God—even though, in certain cases, He did. It was up to the Father to exalt Jesus to His right hand after His mission on earth was accomplished (Acts 2:33). It also is up to the Father, at a certain time in the future, to cause everyone to know that Jesus is Lord and to bow before Him (Philippians 2:9-11). Secondly, the enemies of Jesus recognized, through many of His statements, that He claimed to be God. Certain people are our enemies because they vehemently disagree with what we represent or espouse. That is why Jesus’ enemies hated Him, not even realizing—or, rather, refusing to take the time to comprehend—that He had something to offer them which would have eternally and infinitely positive benefits. There are, in fact, numerous accounts in the Gospels where Jesus asserted that He was God or the Messiah (Christ); or He claimed to be the Son of God, thereby alluding to His own status of deity. In a number of other places, many people—including His enemies—acknowledged that Jesus was God, that He was the Son of God, or that He professed to be God or God’s Son. When many were about to stone Jesus for “blasphemy” (John 10:30-39), He said, “Why then do you accuse me of blasphemy because I said, ‘I am God’s Son’?” (10:36). All things have been committed to me by my Father. No one knows the Son except the Father, and no one knows the Father except the Son and those to whom the Son chooses to reveal him (Matthew 11:27). But about the Son he says, “Your throne, O God, will last for ever and ever, and righteousness will be the scepter of your kingdom” (Hebrews 1:8). No one who denies the Son [Jesus] has the Father; whoever acknowledges the Son has the Father also. ... And this is the testimony: God has given us [believers] eternal life, and this life is in his Son. He who has the Son has life; he who does not have the Son of God does not have life (1 John 2:23, 5:11,12). The only way to attain eternal Life in the presence of God, the Father, is through Jesus, the Son. When Jesus was led before the council of the elders of the people (Luke 22:66-71) and made the statement that “...the Son of Man will be seated at the right hand of the mighty God,” they asked, “Are you then the Son of God?” (22:69,70a). Jesus replied, “You say that I am,” which is interpreted in the NIV Bible as, “You are right in saying that I am” (22:70b). His enemies confirmed that they understood this to be a claim by Jesus to be the Son of God by their response, “Why do we need any more testimony? We have heard it from his own lips” (22:71). “Why are you thinking these things in your hearts? Which is easier: to say, ‘Your sins are forgiven,’ or to say, ‘Get up and walk’? But that you may know that the Son of Man has authority on earth to forgive sins....” He said to the paralyzed man, “I tell you, get up, take your mat and go home” (Luke 5:22-24). At this, the man “...stood up in front of them, took what he had been lying on and went home praising God” (5:25). The skeptics of Jesus were right: Only God can forgive sins. What they were wrong about is that Jesus was not committing blasphemy by implying that He was God, since He truly was God. I looked, and there before me was a white cloud, and seated on the cloud was one “like a son of man” with a crown of gold on his head and a sharp sickle in his hand (Revelation 14:14). Once, a Samaritan woman had a unique experience with Jesus, the Messiah/Christ (John 4:1-42). Many Samaritans believed in Jesus because of the woman’s testimony: “He told me everything I ever did” (4:39), she said. While speaking with Jesus, she had said, “I know that Messiah” (called Christ) “is coming. When he comes, he will explain everything to us” (4:25). Jesus’ response was a claim that He indeed was the Messiah: “I who speak to you am he” (4:26). Due to the woman’s testimony, many also realized that “this man really is the Savior of the world” (4:42). Another statement by Jesus was, “Everyone who listens to the Father and learns from him comes to me” (John 6:45). He was asserting that the Father points to Him, Jesus, as the intermediary (Messiah or Christ) between people and the Father. Even as Jesus hung on the cross, many people who stood watching said, “He saved others; let him save himself if he is the Christ [Messiah] of God, the Chosen One” (Luke 23:35). This confirmed that they understood Jesus to have professed to be the Messiah. Rather than save Himself, Jesus forfeited His own personal “human rights” so that others could be saved. How many people today are willing to give up their “human rights” voluntarily on the behalf of others? The number seems to dwindle more every day. It was at Chanukah (Hanukkah), the Jewish feast of the dedication of the temple, that many gathered around Jesus, and He spoke things that made them want to stone Him (John 10:22-33). They said, “If you are the Christ [Messiah], tell us plainly” (10:24). Jesus answered, “I did tell you, but you do not believe. The miracles I do in my Father’s name speak for me...” (10:25). He later added, “I and the Father are one” (10:30). (See also God: One, Two, and Three). They picked up stones to stone Him (John 10:31). They told Him that they were not going to stone Him for performing miracles but, rather, “...for blasphemy, because you, a mere man, claim to be God” (10:33). Many today know that Jesus was claiming to be God, but they refuse to acknowledge His claim. Beyond all question, the mystery of godliness is great: He [God] appeared in a body [or in the flesh], was vindicated by the Spirit, was seen by angels, was preached among the nations, was believed on in the world, was taken up in glory (1 Timothy 3:16). This is what the LORD says—Israel’s King and Redeemer, the LORD Almighty: I am the first and I am the last; apart from me there is no God (Isaiah 44:6). The eternal God is “the first and the last” because He always has existed, and always will exist, “from everlasting to everlasting” (Psalm 90:2). The risen, glorified Jesus appeared to the apostle John, who wrote the book of Revelation. He told John that He was “the First and the Last” (Revelation 1:17, 2:8), as well as “the Alpha and the Omega” and “the Beginning and the End” (1:8, 21:6, 22:13). These were foundational claims, by Jesus, to be God. A name of God, who appeared to Moses in a burning bush, is “I AM” (Exodus 3:1-15—see “YHVH or Yahveh, the ‘I AM’”). In fact, Jesus also made claims of Himself as being the great “I AM”—and, thus, God. Once, when Jesus’ disciples were rowing across the Sea of Galilee, a storm arose; Jesus walked out a few miles on the surface of the water to where they were in their boat (Matthew 14:22-33). They were terrified, thinking He was a ghost; but Jesus said, “Take courage! It is I. Don’t be afraid” (14:26,27). The phrase, “It is I,” is translated literally from the Greek text, “I am”; it was a claim by Jesus to be God. Soon thereafter, the storm calmed (14:32), because only God could have caused it to do so. To another group of people, Jesus twice affirmed that He was the “I AM” (John 8:18-59). (Yeshua, Hebrew for “Jesus,” means “Yahweh [God, the ‘I AM’] saves.”) He said, “You are from below; I am from above. You are of this world; I am not of this world. I told you that you would die in your sins; if you do not believe that I am..., you will indeed die in your sins” (8:23,24). Later, Jesus stated, “Your father Abraham rejoiced at the thought of seeing my day; he saw it and was glad” (8:56). They questioned how He possibly could have seen Abraham, since Jesus was not yet even fifty years old (8:57), to which Jesus replied, “I tell you the truth,...before Abraham was born, I am!” (8:58). Knowing that Jesus had just claimed to be God, “...they picked up stones to stone him...” (8:59), which was the punishment for presumed blasphemy. Little did they realize that Jesus is eternal, as are the Father and the Holy Spirit. The Father and Son, as well as the Holy Spirit, all are God. At the Last Supper, Jesus implied that all who ate with Him were clean, other than the one (Judas) who would betray him (John 13:10-19). He said, “I am telling you now before it happens, so that when it does happen you will believe that I am He” (13:19)—or, literally translated, “that I am.” Only God could know beforehand exactly what was going to happen. While Jesus and His disciples were in an olive grove, Jesus knew that He soon would be betrayed (John 18:1-7). When the soldiers and officials came to arrest Jesus, He asked who it was that they wanted (18:4). When they replied, “Jesus of Nazareth,” Jesus’ response was, “I am he”—or, literally, “I am” (18:5). When Jesus stated this declaration to be God, “...they drew back and fell to the ground” (18:6). Why? Because they were in the direct presence of God in flesh and had experienced a momentary release of His overwhelming Power. Finally, when Jesus was being falsely accused and interrogated by the high priest, chief priests, elders, and teachers of the law (Mark 14:53-65), the high priest directly asked him, “Are you the Christ, the Son of the Blessed One?” (14:61). “I am,” said Jesus. “And you will see the Son of Man sitting at the right hand of the Mighty One and coming on the clouds of heaven” (14:62). The fact that the high priest (and the others) understood this to be a claim by Jesus to be God is evidenced by his comments, “Why do we need anymore witnesses? ... You have heard the blasphemy. What do you think?” (14:63,64). They knew that Jesus had claimed to be God, and they “...all condemned him as worthy of death” (14:64) because they simply did not want to hear it or believe it. There should be no question as to whether or not Jesus claimed to be the Messiah, the Son of God, and even God, the “I AM.” He did, and He was/is. As has been shown, many recognized His affirmations to be these things. Many believed and agreed (Matthew 2:1-11, 3:16,17, 8:8,19, 14:33, 15:31, 16:16; Mark 1:7,8, 3:11; Luke 8:43-48, 18:35-43, 24:36-53; John 4:42, 6:14, 8:30, 10:42, 11:45, 20:28). Others made up lies to attempt to explain away the miracle of Jesus’ resurrection (Matthew 28:11-15); yet a “large sum of money” (28:12) would not have been given to cover up the resurrection event, had it not happened. Paul said that Jesus “...through the Spirit of holiness was declared with power to be the Son of God by his resurrection from the dead: Jesus Christ our Lord” (Romans 1:4). Though Jesus is the Son of God and was resurrected from the dead, many still are willing to take a chance—a very costly risk—and not accept these facts. He continues to be God, and always will be God—both co-existent with, and at the right hand of, the Father in heaven. Some Christians believe that Jesus “gave up” His deity while on earth. Just one reason I disagree with this is because, “No man can redeem the life of another or give to God a ransom for him...” (Psalm 49:7). If Jesus had been merely a man, His sacrifice would not have been enough; only a perfect, sinless God Himself could carry enough value to ransom mankind from the consequences of sin. Jesus was, in His very nature and form, God (Philippians 2:6). Also, Jesus retained God’s Authority, during His life on earth, which the Father had given Him (Matthew 7:29, 21:24; Luke 4:36; John 10:18). And He would not have been able to give this same Authority, as well as the Power which accompanies it, to His twelve disciples (Matthew 10:1) if He temporarily had “forfeited” His deity. Jesus never has ceased to be God. John said, “Who is it that overcomes the world? Only he who believes that Jesus is the Son of God” (1 John 5:5). (See “overcoming” in “repentance, enduring, and overcoming”.) Jesus helps us to overcome the many temptations and challenges we encounter daily, because He personally knows how difficult they are to overcome. “Because he himself suffered when he was tempted, he is able to help those who are being tempted” (Hebrews 2:18). By believing in Jesus, He not only will give us strength to overcome, but one day He also will introduce us personally to the Father and the Father to us. What an awesome day of pure amazement and rejoicing that will be! A unique event occurred at one point during Jesus’ earthly life, which unquestionably confirmed His divinity. On a high mountain, with Peter, James and John as witnesses, Jesus was transformed or transfigured (Matthew 17:1-8). His face shone as bright as the sun, and His clothes became dazzling white and as bright as lightning. Appearing and talking with Him were the prophet Elijah and also the lawgiver Moses. A bright cloud enveloped them, and the Father’s voice from the cloud stated that Jesus was His Son and commanded all to listen to Jesus (17:1-3,5). For a few moments, Jesus essentially pulled back His flesh and revealed the radiant glory of God (see “Shekinah Glory”) within, further demonstrating that He was God in flesh while He walked the earth. The Father acknowledged Him as the Son of God during this awesome event. Incidentally, while Moses was leading the Israelites through the desert, God told him to speak to a rock so that water would pour out of it for everyone to drink (Numbers 20:7,8). Instead, Moses struck the rock twice, bringing forth water (20:11). Because of this episode, God told Moses that he would not enter the promised land (20:12). However, it seems that Moses was given a second opportunity to speak to the “Rock” when he and Elijah spoke with Jesus at His transfiguration (Matthew 17:1-3). Indeed, Jesus the “Rock” was and is God (Deuteronomy 32:3,4). It seems that human nature requires an idol, a physical form or image of a god, to worship. Of course, all idols crafted by people are worthless (Isaiah 44:9-20). This is one reason why Jesus came: so we would have an accurate, physical manifestation of the One, True God. In the beginning was the Word, and the Word was with God, and the Word was God. He [Jesus, the Word] was with God in the beginning. ... The Word became flesh and lived for a while among us. We have seen his [Jesus, the Word’s] glory, the glory of the one and only Son, who came from the Father, full of grace and truth (John 1:1,2,14). Peter stated that “...long ago by God’s word [Jesus] the heavens existed and the earth was formed...” (2 Peter 3:5). And John reiterated that “the Word” is a title of Jesus when he stated that “...his [Jesus’] name is the Word of God” (Revelation 19:13). No one has ever seen God, but God the One and Only [Begotten], who is at the Father’s side, has made him known (John 1:18). Jesus was the only begotten Son of God. But John goes one step further and calls God Himself the “One and Only [Begotten].” This is because Jesus, who is God personified, was and is the physical manifestation of the One and Only God. It is I who made the earth and created mankind upon it. My own hands stretched out the heavens; I marshaled their starry hosts (Isaiah 45:12). He [Jesus] is the image of the invisible God, the firstborn over all creation. For by him all things were created: things in heaven and on earth, visible and invisible, whether thrones or powers or rulers or authorities; all things were created by him and for him. He is before all things, and in him all things hold together (Colossians 1:15-17). Once, when Jesus was in a boat with His disciples (Mark 4:35-41), “A furious squall came up, and the waves broke over the boat, so that it was nearly swamped” (4:37). Jesus (who was asleep, so they had to awaken Him) “...got up, rebuked the wind and said to the waves, ‘Quiet! Be still!’ Then the wind died down and it was completely calm. ... They were terrified and asked each other, Who is this? Even the wind and the waves obey him!’” (4:39,41). Jesus clearly is Lord over everything He has created, including the elements. ...has spoken to us by his Son, whom he appointed heir of all things, and through whom he made the universe. The Son is the radiance of God’s glory and the exact representation of his being, sustaining all things by his powerful word. After he had provided purification for sins, he sat down at the right hand of the Majesty in heaven (Hebrews 1:2,3). Indeed, without the creative ability of Jesus, nothing other than God Himself would exist. And, without the sustaining capacity of Jesus and the Holy Spirit, everything that has been created simply would disintegrate. The Father, Jesus, and the Holy Spirit, collectively, are God. He exists as a unified single entity, as well as in multiple forms or facets. God is both singular and multiple at the same time. To better understand the significance of Jesus’ relationship with us, let us first look at the Jewish engagement and marriage customs at the time of Jesus. The bridegroom had to approach his chosen bride with a contract or covenant of marriage (the Shitre Erusin); he then paid a price (often high) to the bride’s father. At the signing of the contract, the groom would drink a toast with the bride; her partaking of the wine committed herself to this man, agreeing to follow the contract that now was a legal document. At this time, they would be called husband and wife, although their status actually was that of being pledged or betrothed rather than being fully married (Matthew 1:18). Next, the bridegroom would tell the bride that he was going to prepare a place for her. He would return to his father’s house, where he would build a bridal chamber (or chadar or “little mansion”), the place of their eventual honeymoon. The bride—who was bought for a price, consecrated for marriage, and set apart—would stay at home. She wore a veil, emphasizing her purity and modesty and showing all other men that she already belonged to someone else. She knew the general time that her intended husband would come for her but not the exact day; therefore, she always was ready and watching for his return. The bridegroom would take his father’s advice about the price paid for the bride, the suitability of the honeymoon chamber, as well as the best time to go and get his bride. Finally, the long-awaited day would come when the groom and his two groomsmen (the two witnesses required for a Jewish wedding) would slip unexpectedly over to the bride’s home. A quick shout and trumpet sound would be given to announce the groom’s arrival, and the bride and her attendants would rush out quickly to meet her bridegroom before he even reached her home. Everyone in the bridal party would return with the bridegroom to his father’s home. There would be an official ceremony (the Kedushin) with a second contract (the Ketubah) containing the promises that the groom pledged to his wife. The celebration would last from one to seven days, depending on the wealth of the groom’s family. Jesus brought with Him a new covenant (Jeremiah 31:31-34; Luke 22:20; 1 Corinthians 11:25; Hebrews 8:6-13, 9:15, 12:24) to the Jews (and then to the Gentiles) which was different from the old one God had made with Abraham, Isaac, and Jacob (see ANCIENT PROMISES and COVENANTS of GOD). The new covenant was much superior to the old one (Hebrews 8:6,7). As a “contract” for His “Bride” (all believers), He would have to pay an extremely high price—His own life (Galatians 1:4) and blood (Matthew 26:28). Why? ...Christ loved the church and gave himself up for her to make her holy, cleansing her by the washing with water through the word, and to present her to himself as a radiant church, without stain or wrinkle or any other blemish, but holy and blameless (Ephesians 5:25-27). At the Last Supper, Jesus offered a cup to His disciples (Matthew 26:27), the first members of His Bride. They drank the wine with Him (as all believers do during Communion), sealing their commitment to remain true to Him until His Second Coming. The wine was representative of the blood He would shed for them (see Jesus’ blood, the wine). In my Father’s house are many rooms [mansions or chambers]; if it were not so, I would have told you. I am going there to prepare a place for you (John 14:2). Following Jesus’ death and resurrection, and His physical appearance to people for forty days (Acts 1:3b,9), He ascended to His Father’s “house” in heaven (Luke 24:51). He has promised to come again to take away the resurrected and transformed bodies (1 Corinthians 15:51-53—see changed bodies and caught up) of all who believe in Him to the place He has prepared for them (John 14:2,3; 1 Thessalonians 4:16,17). While on earth, Jesus indicated that nobody knew the exact day or hour of His return; only the Father possessed this knowledge (Matthew 24:36—see dates of prophetic fulfillment). Two witnesses (Revelation 11:3—see the two witnesses) will come to earth prior to Jesus’ appearance, when He will “steal away” His Bride at the main Rapture of Believers, the Pre-wrath Rapture (see The Rapture). He will appear in the clouds (Matthew 24:30,31), probably about a year prior to His second advent (bodily descent) back to earth, and everyone alive on earth will see Him (Revelation 6:16). At that time the kingdom of heaven will be like ten virgins who took their lamps and went out to meet the bridegroom. Five of them were foolish and five were wise. The foolish ones took their lamps but did not take any oil with them. The wise, however, took oil in jars along with their lamps. The bridegroom was a long time in coming, and they all became drowsy and fell asleep. At midnight the cry rang out: “Here’s the bridegroom! Come out to meet him!” Then all the virgins woke up and trimmed their lamps. The foolish ones said to the wise, “Give us some of your oil; our lamps are going out.” “No,” they replied, “there may not be enough for both us and you. Instead, go to those who sell oil and buy some for yourselves.” But while they were on their way to buy the oil, the bridegroom arrived. The virgins who were ready went in with him to the wedding banquet. And the door was shut. Later the others also came. “Sir! Sir!” they said. “Open the door for us!” But he replied, “I tell you the truth, I don't know you.” Therefore keep watch, because you do not know the day or the hour (Matthew 25:1-13). Notice how Jesus indicated that He, the Bridegroom, would arrive at midnight. This very well could correspond to a Mid-tribulation Rapture in the middle of the 70th Week, when only a select few “firstfruits” of His Bride will be transformed and then removed (thus avoiding the dreaded Great Tribulation period). I suspect that the “wedding supper of the Lamb” (Revelation 19:9—see wedding supper of the Lamb) will be an ongoing celebration, outshining any feast which ever has taken place at anytime or anywhere, and that more and more members of the Bride (“foolish-turned-wise” virgins) will appear during its duration. The great wedding supper will culminate, on earth, at the Feast of Sukkot, a few days after Jesus’ second advent back to earth on Yom Kippur. Jesus said, “I am the way and the truth and the life. No one comes to the Father except through me” (John 14:6). When asked who would be saved, Jesus indicated that He was the “narrow door” of salvation (Luke 13:23,24). Unfortunately, not everybody will go to heaven, although many religions teach that everyone will. Jesus was a good man and a great prophet. However, he was infinitely greater than the most important man or prophet of any other religion. This is because Jesus Himself actually created and constructed the entire universe, and He is the One holding it altogether (Colossians 1:15-17; John 1:1-3; Hebrews 1:2,3). Jesus was, and is, God. 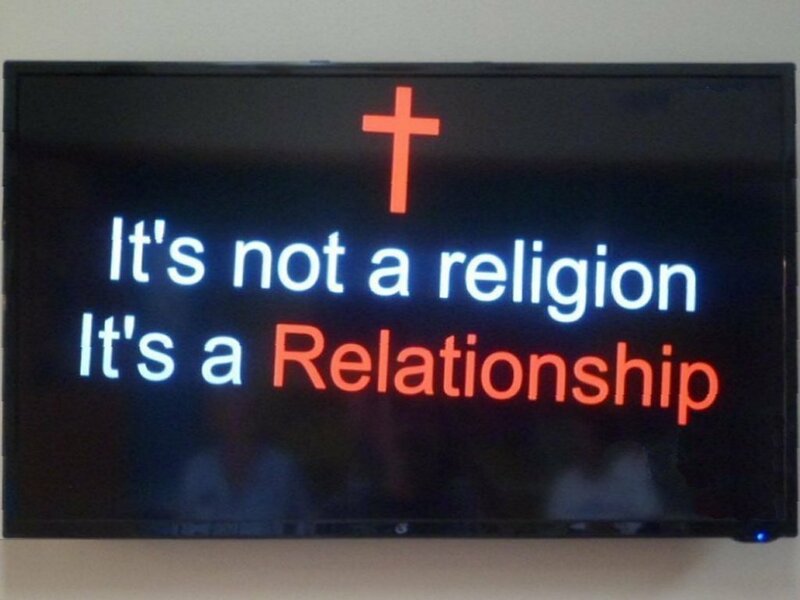 Christianity actually is not so much a religion as it is a relationship with the Sovereign, Almighty God. In all other religions, mankind strives to reach God—to be “good enough” to attain His approval and mercy. Unfortunately, no one ever can be good enough to earn eternal life. In no other religion was God, the Creator of the universe, humiliated, even unto death on a cross. Jesus, God incarnate, humbled Himself to the level of being insulted, flogged, beaten, and ultimately crucified for the sins of the world. Why did Jesus, the Son of God, have to die? All people have sinned and have fallen short of the glory of God (Romans 3:23). God the Father is perfect (Matthew 5:48) and cannot accept anyone into His holy presence who is not perfect. Without the shedding of blood to cleanse all of our sins, there is no forgiveness of sin (Hebrews 9:22). Jesus had to die, as a blood sacrifice, to bring all of those who believe in Him to the Father. The only perfect man who ever lived was Jesus; He was guilty of no sin or crime. Just as the blood of innocent Passover lambs had to be shed to atone for the sins of the ancient Israelites (Exodus 12:3-7), so the blood of Jesus, our innocent Passover Lamb (1 Corinthians 5:7b), had to be shed for the sins of humanity. But each of us, individually, must accept and embrace the free gift of Jesus’ personal sacrifice for our sins; otherwise, we cannot receive eternal salvation, and we will be lost. The choice is ours. On the third day after His crucifixion, Jesus rose from the dead—the firstfruits of those who also will rise from the dead and never die again (1 Corinthians 15:20). Salvation, unto eternal life, involves confessing that Jesus is Lord and believing in one’s heart that Jesus was raised from the dead (Romans 10:9,10).